Here is another great printable coupon to help bring down the cost of Easter Basket Items. If you have a little girl, she might love nail polish in her Easter basket. 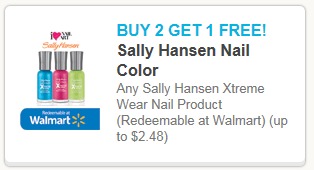 I know I would 😉 Sally Hansen Hard as Nails Xtreme Wear is a new product, its enhanced with “Hard as Nails”with an easy grip, easy glide for complete control. Head to Walmart and pay $1.65 each after coupon, when you buy 3.